Lake Como (Lago di Como) is one of the famous Italian Lakes destinations, not far from Milan in the north of Italy. Lake Como is long (50km), slender and extremely deep. The southern end forks into two long 'legs', with the picturesque town of Bellagio situated on the promontory between them. Like the other Italian Lakes, Lake Como has been popular as a resort since the days of the Roman Empire. Visitors ever since have admired the blue waters and relaxed in luxurious villas in the wooded lakeside slopes above. Today, most of the towns around the shores of Lake Como are popular with tourists, walkers, cyclists and swimmers. Como is on Italy's main railway network, and trains run from Milan to Como frequently, taking around 40 minutes. They depart from Milan's Stazione Centrale and Stazione Porta Garibaldi, and arrive at San Giovanni, Como's main station. There is a direct bus service from Bergamo Airport to Como, also stopping - subject to advance booking - at towns along the western shore up to Menaggio. The service is called the Lake Como Express and runs three times a day - you can read the latest timetables and make bookings on the company's website (see links panel). 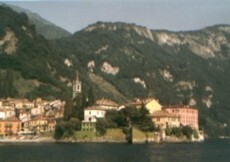 Buses around Como, including onward travel from Como to Bellagio, are operated by ASF Autolinee. These are cheap local services and a good way of getting around without a car. 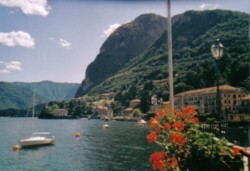 Steamers, boats and buses serve all the main towns on Lake Como. A frequent boat service connects the central resorts, Lenno, Tremezzo, Villa Carlotta, Cadenabbia, Menaggio, Bellagio and Varenna, including a car ferry. A less frequent but faster boat travels the full length of the lake from Como (with stops at most of the above). Buses run approximately hourly all the way up the west coast from Como round to Colico at the north-east. Bellagio is a beautiful little town in a picture-perfect location on the promontory where Lake Como separates into two branches. The town is historic and charming, with a waterfront promenades, stately hotels and two gardens open to the public: Villa Serbelloni and Villa Melzi. Bellagio's tourist information offices are by the ferry jetty and in Piazza della Chiesa. Como is a lively and pleasant town with an appealing historical centre and a scenic location at the southern end of the east branch of Lake Como. The impressive cathedral (Duomo), like most in Italy, was built and added to over a period of centuries, so you can admire Gothic and Renaissance features including some fine tapestries and paintings. The town's earlier cathedral (built in the tenth century), San Fedele, is another fine sight, as are the tall nine-hundred-year-old gateway, Porta Vittoria, and the Romanesque church Sant'Abbondio. The town's art gallery (Pinacoteca) is also worth a visit. For a short trip out of town, take the funicular up to the top of the hill above Como, where you can enjoy spectacular views. If you want a taste of contemporary Italian culture, Como's football team, play at a stadium close to the lake, so if your timing is right you could see a decent football match. 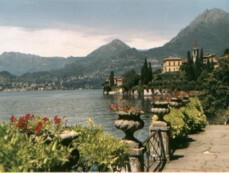 Menaggio is a popular holiday destination, with a good range of hotels. 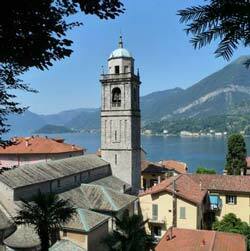 The town is located on the western shore of Lake Como, and has small stretches of shingle beach. From Menaggio you can travel to Lake Lugano or embark on mountain hikes. The town is a useful base for exploring Lake Como; with good bus and ferry connections. Menaggio Tourist Information Office is in the central Piazza Garibaldi, and can supply plenty of useful information on attractions and activities in the area, including advice on walking in the mountains. Varenna is a peaceful resort, smaller than Bellagio and also very beautiful. You can admire views from the Castello de Vezio or simply relax by the lakeside. Varenna Tourist Information Office is in Piazza San Giorgio. Lecco is a rather industrialised town on the least touristy section of Lake Como, the fiord-like eastern branch of the lake. However, the town has good public transport and good opportunities for serious mountain-walking. The nineteenth-century novelist Alessandro Manzoni set his important novel I Promessi Sposi (The Betrothed) here, in his hometown. The Cadogan guides to Italy are always interesting and entertaining. As well as the historical and cultural background, this book contains anecdotal gems and recommendations to enliven your holiday in the Lakes. A convenient and practical guidebook with information about the Lake areas, and suggested tours. The Dorling Kindersley travel guides are glossy and lavishly illustrated, and good for getting a visual overview of the area. For more practical details and background, combine this guide with a more text-heavy book.